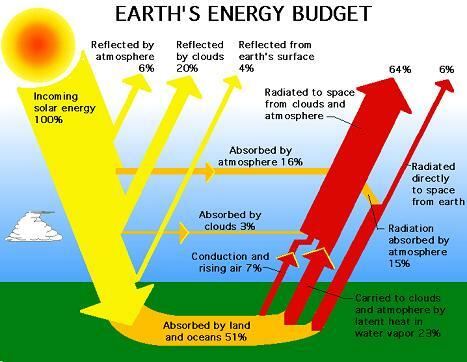 The radiation budget represents the balance between incoming energy from the Sun and outgoing thermal (longwave) and reflected (shortwave) energy from the Earth. waste heat from fossil fuel consumption (about 0.007%, or about 13 terawatts; or about 0.025 W m-2). Note that the solar constant varies (by approximately 0.1% over a solar cycle); and is not known absolutely to within better than about one watt per square metre. Hence the geothermal and tidal contributions are less than the uncertainty in the solar power. The average albedo (reflectivity) of the Earth is about 0.3, which means that 30% of the incident solar energy is reflected back into space, while 70% is absorbed by the Earth and reradiated as infrared. The planet’s albedo varies from month to month, but 0.3 is the average figure. It also varies very strongly spatially: ice sheets have a high albedo, oceans low. The contributions from geothermal and tidal power sources are so small that they are omitted from the following calculations. Emission of greenhouse gases, and other factors (such as land-use changes), modify the energy budget slightly but significantly. The IPCC provides an estimate of these forcing, insofar as they are known. The largest and best known are from the well-mixed greenhouse gases (CO2, CH4, halocarbons, etc. ), totaling an increase in forcing of 2.4 W m-2 relative to 1750. These are less than 1% of the solar input, but contributes to the observed increase in atmospheric and oceanic temperature. Thank you for posting this i am really interested in the subject, thank you! Your website is awesome! why is google blocking this information? that does not make sense to me. most people are unaware and do not care that they do not know. please explain. Who or what is servicing and maintaining this vicious cycle of ignorance?